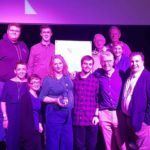 Wycombe Sound, the not-for-profit radio station for High Wycombe, has been granted a licence from Ofcom to broadcast full time for the next five years. In 2015 the team moved into permanent studios in Bridge Street which also features The Radio Kitchen, and The Blue Room, a dedicated space for live bands, choirs and performers. The team are now raising money to buy transmission equipment and plan to be on air in the autumn. In the meantime you can hear them broadcasting online and via their App from events including Frogfest, Wycombe Comic Con and Dash For Dad. Visit www.wycombesound.org.uk or call 01494 449900 for further information.